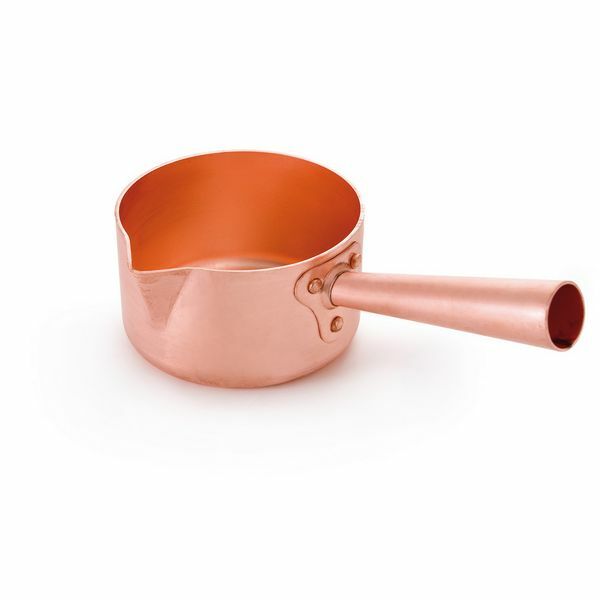 Absolutely fell in love with these Mauviel copper saucepans. The French company has been making them since mid 19th century, and they are still today highly appreciated by chefs in professional kitchens and by cooks in domestic environments due to the coppers' high thermal and electrical conductivity. Though, great care has to be taken when using copper pans, as the material is soft and dents easily. Copper releases toxins when in touch with acid foodstuffs. In the past, they used to tin-line by hand the pans and pots from inside, today copper pans are mainly industrially lined with stainless steel. I decided to work on copper, because of its beautiful colour, that actually oxidises and patina over time, and therefore creates feel of longevity towards the object. I feel that due to the metals' soft appearance, the dents that will appear from use, will give a hint of nostalgia and makes the owner want to nurture the beloved sauce pan or pot even more greatly, arousing it to live longer. I have found inspiration from Kaikado's tea caddies. These beauties are made from copper (stainless steel lined) or alternatively you can get them in brass, tin or silver. Then caddies varies in size and purpose, some of them have a added handle or others has layered compartments making them available for many uses. It is the simple unembellished design that strikes me!